Horizontal Flow Wrapper (HFFS) Machine that makes a three sealing pillow pack. Specially oriented to bakery, cookies, chocolates and candy-confectionery industries. 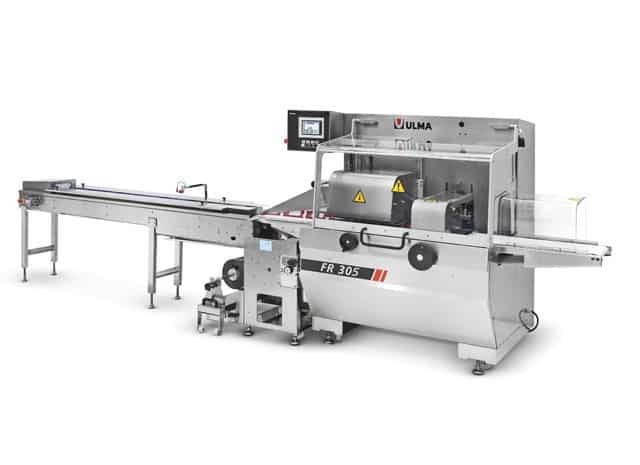 The new FR 305 flow pack wrapper is the result of ULMA’s commitment to innovation and technological development. This ongoing process has given rise to the new FR 305 as part of the range of rotary jaw packaging machines. The new FR 305 features all these characteristic strength, reliability, and operation simplicity of the ULMA machines, together with an ergonomic cantilever design that makes cleaning and sanitising easier. Added to these well known characteristics of ULMA machines, the new model also features very high flexibility for the different format changeovers thanks to the state of the art industrial PC electronic platform.